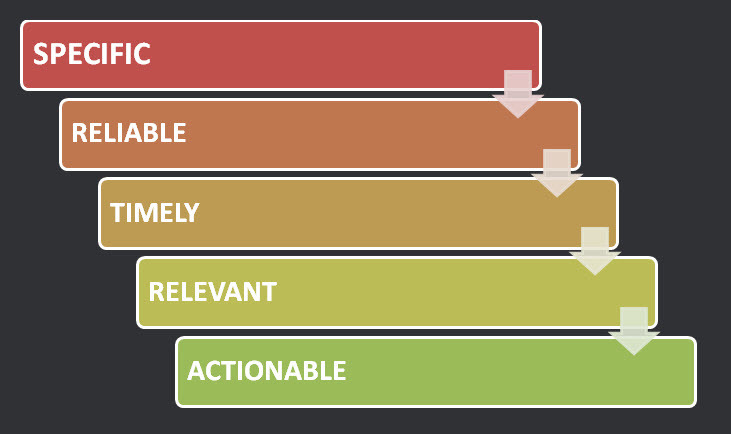 WHAT IS YOUR RESILIENT SCORE™? Annapolis, MD (March 6, 2018). In response to the continued rise of active shooter incidents throughout the US resulting in horrific tragedy, Resilient Corporation, through its subsidiary CRA, Inc., announces the launch of its revised and improved Active Shooter Workshop training program. AN ORGANIZATION’S OR GEOGRAPHIC REGION’S CAPACITY TO ANTICIPATE DISRUPTIONS, ADAPT TO EVENTS, AND CREATE LASTING VALUE. Resilient Corporation offers an end-to-end Resilience Solution that helps forward-thinking leaders understand, manage and prepare for disruptions while finding new opportunities for efficiencies and growth. “Growing global threats, cyber-attacks and thefts, natural disasters, severe economic fiscal crises, and efforts by governments to tighten laws and regulations governing the spectrum of business operations and national life to safeguard their economies against such disruptions, have changed the way businesses, executives, investors, politicians and regulators evaluate the performance and preparedness of companies, local and national institutions, and, at the macro level, countries and alliances. Today ensuring companies, countries and their foundational and enabling critical infrastructures are operationally resilient across the spectrum of their operations and under all conditions is vital to ensuring companies’ financial growth and profitability, and, moreover, the safety, security, quality of life and future of a nation. 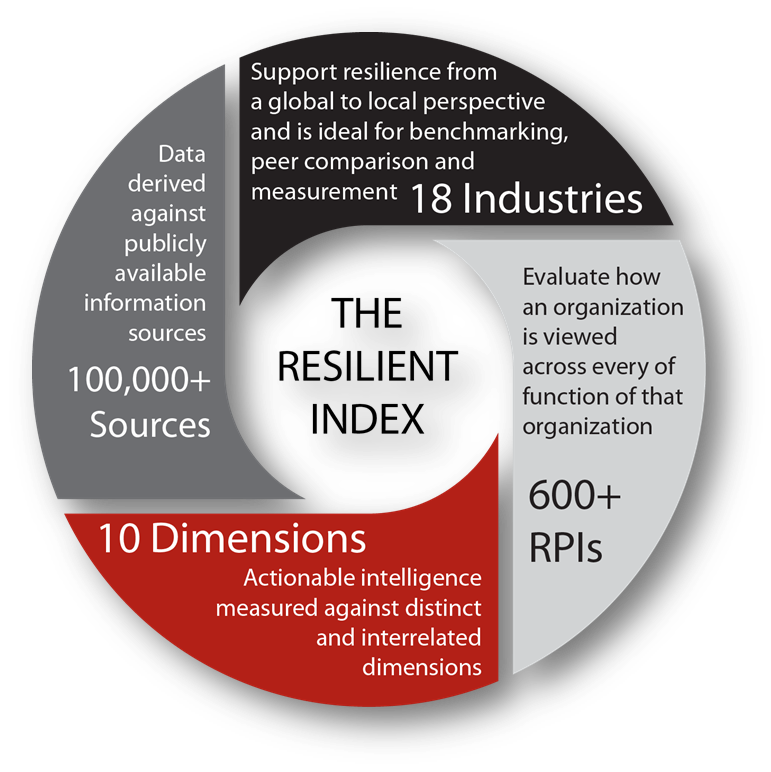 More and more people are talking about the concept of resilience, but Resilient Corporation℠ is the first to provide an independent and objective measurement of it that can be applied across all global industry sectors. Determine the right questions to ask. Corporations and government agencies that fail to actively and purposefully identify, monitor, measure and ultimately manage vulnerabilities risk substantial, sustained loss of value. 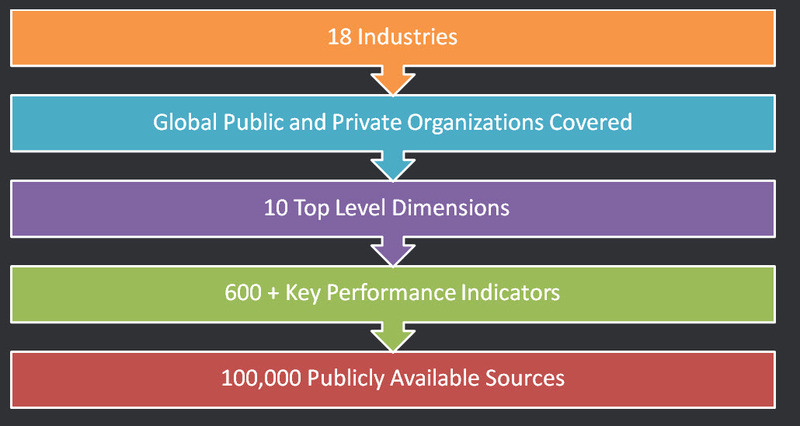 To identify these vulnerabilities, Resilient Corporation℠ has developed a completely independent benchmark for understanding, defining, measuring and quantifying organizational resilience. The Resilient platform is designed to enable its customers to improve their competitive position and shareholder value by Capturing a Wider View™ of any business or government landscape. 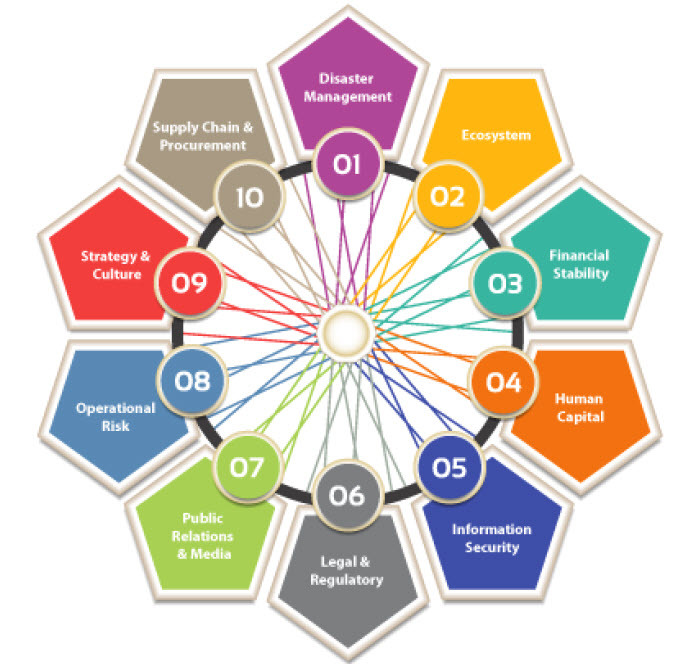 The Resilient Market Classification Schema™ consisting of 18 global industries and public sectors designed to support resilience from a global to local perspective and is ideal for benchmarking and peer comparison. Capabilities to proactively plan and adequately respond to an immediate event and rapidly recover. Reliability and risks of the organization’s local, logical, tangible and intangible business environment(s) outside its direct control. Strength and stability of the organization from a financial perspective, contributing to its ability to finance core functions during a disruptive event. Ability to manage risks to the business related to the performance and management of its organizational design in normal operations and in crisis. Comprehensiveness and effectiveness of a program to secure information assets and prevent their theft or irreparable destruction in any scenario. Level of compliance with established laws, regulations, guidelines, best practice or specifications, or effective management of the processes of becoming so. Capabilities to measure public sentiment and the life cycle of a disruptive event, and contain the negative effects or exploit the potential positive outcomes. Extent of a formalized framework for identifying and managing many forms of day-to-day threats and vulnerabilities. Ability to proactively plan and recover from supply chain disruptions, and to procure mission-critical assets. Learn more about how Resiliency impacts business and government! © 2006-2018 Resilient Corporation. All rights reserved.